Hunter Douglas EverWood® Alternative Wood Blinds offer the beautiful look of hardwood with the benefits of being crafted with alternative materials. This collection is guaranteed to never fade, yellow or warp in any climate. 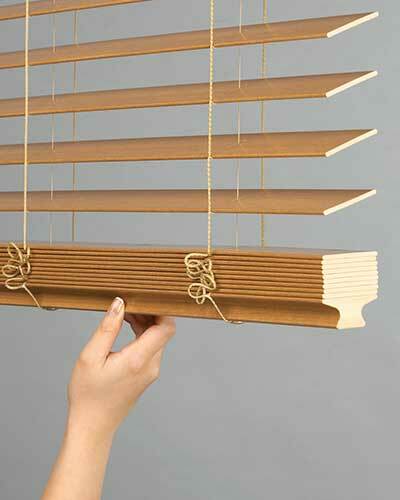 EverWood® Blinds can be simply washed and are easy to clean. With three options in the collection to chose from, our staff at At Home Designs can help you decide which option is best for your style and budget. Everwood® TruGrain® Blinds are offered in both 2″ and 2 1/2″ slat sizes. This window treatment offers the close look of hardwood with realistic staining options including nine finishes such as linen, grass weave and leather. Everwood® Distinctions™ Blinds are also offered in 2″ and 2 1/2″ slat sizes and come in a range of white and off-white colors. 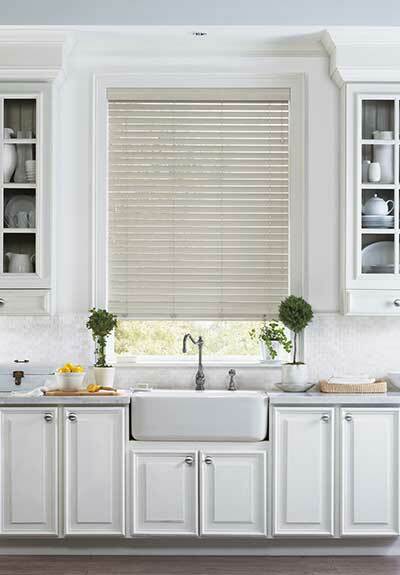 Everwood® Renditions™ Blinds offer a stream-lined option to fit a more conservative budget. Offered in a 2″ slat size, this window treatment is available in the most popular seven white finishes and four natural grain colors. Stop by the At Home Designs showroom in Hockessin, Delaware to see Everwood® Blinds on display or make an appointment today to start your next design project. Hunter Douglas offers three choices for operating EverWood® Blinds. See how they work in the video below.